Jan's Works of Heart: Who Wants to Visit Central Park? Who Wants to Visit Central Park? 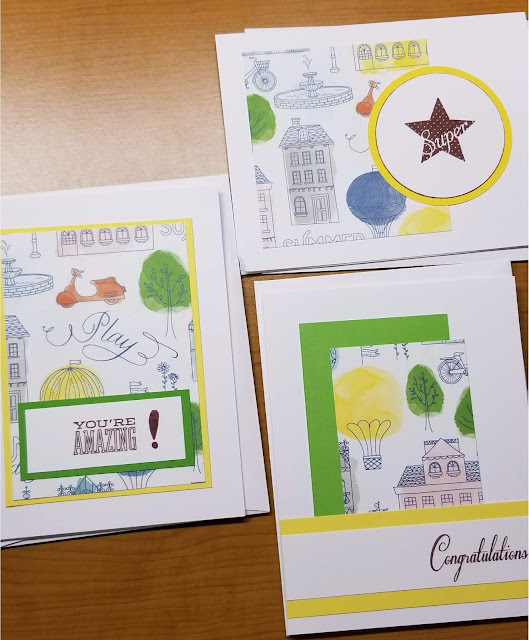 Welcome to the July Cross Canada Blog Hop where we are highlighting the Central Park paper from the 2017/2018 Idea Book. If you got here from Terry's blog, then you are in the right place, but if you get lost along the way, just head back to Michelle's blog where you will find the complete list of hoppers. This month, I started a monthly club at work and decided to start the club with a One Sheet Wonder card class using - what else? - Central Park! This One Sheet Wonder makes 11 cards from one sheet of Central Park and three pieces of cardstock - one White Daisy, one Lemon and one Willow. I used our Nutmeg ink (LOVE that colour!) and went through my stash of stamps to find a few I liked. 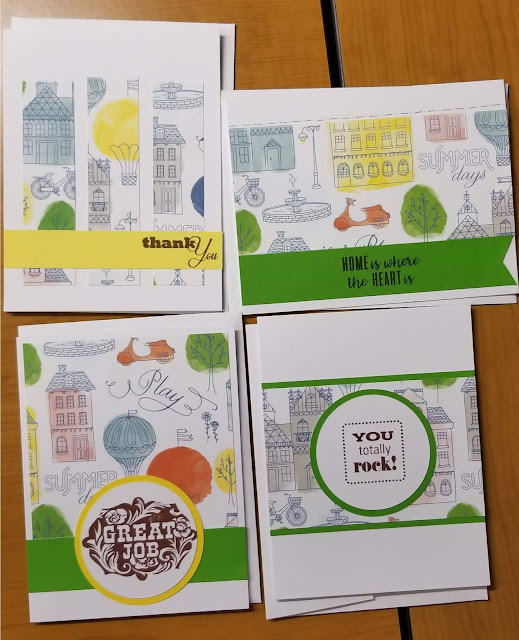 So here are the cards my club ladies are working on this month. Notice the Lemon cardstock. You will see that on some cards it is lighter than others. That is because all of our cardstock is double sided, with one side nice and bright and the other somewhat muted. Same colour, just not as vibrant. I had a piece of B&T left over when I had finished cutting out the paper so decided to make it into a banner. I also flipped the B&T over for that card, then cut two more banners from the Willow and Lemon cardstock. I think they add a nice little pop to the card since the pink is rather pale. The exclamation mark on the You're Amazing card was drawn by hand. I wanted one that fit on the White Daisy but all that I have are either too small or way too big. That's it for me this month. Continue your journey across Canada with Kristine's blog. Remember, if you find a kink in the road, just head back to Michelle's blog for the full list of hoppers. As you hop through, please let us know what you think of our projects. We always love to read your comments! If you see something you really like, contact your local Close to my Heart consultant for more information. Join us next month when we will highlight more beautiful Close to my Heart paper and cardstock. I love them all! 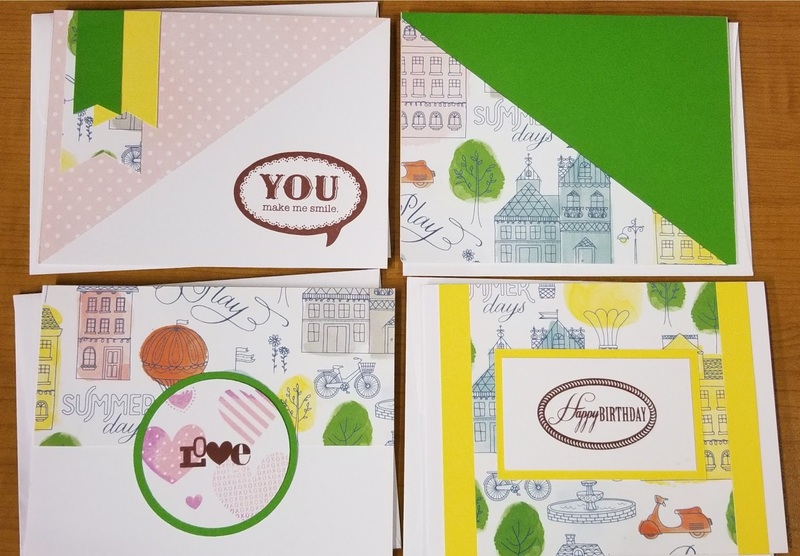 Super cute and super fun cards! this house paper is so adorable ~ and your cards are lovely! Great cards, love that you kept them clean and simple. Well done. what a great bunch of cards! I love one sheet wonders! It's amazing just how many cards you can get from just one sheet of paper and a bit of card stock. Your cards are fantastic.